I mean, can you blame us? The New York City Council had a very good Friday, after Mayor Bill de Blasio signed a law that officially gave every member a 32 percent raise. 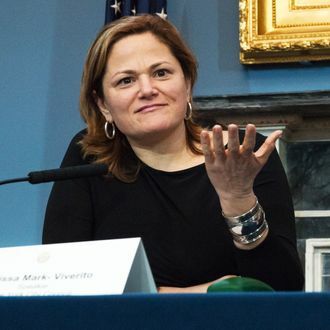 All council members will see their salaries jump from $112,500 to $148,500 — except for Speaker Melissa Mark-Viverito, who only gets a 20 percent increase. But her salary was a little higher to begin with, so she’ll take home $164,500. All raises are retroactive to January 1. “Thirty-two percent?! ?” you’re probably thinking. The bumps are a bit higher than an advisory committee recommended in December — 23 percent versus the 32 percent now on the books — but the raises do come with some significant reforms. Now council members will be considered full-time employees and no longer be able to take outside income, except when it comes from a teaching position. The new law also eliminates other financial perks, such as bonuses for taking leadership or committee positions. So, think of it as a trade-off — the councilors got a way bigger raise than you’ll see this year, but at least you know it’s all ethical (or at least should be). Council members aren’t the only ones who got a pay bump. Other city employees, including the five district attorneys, borough presidents, the comptroller, and the public advocate will also have fatter pay checks, but no jump as big as the Council’s. Mayor de Blasio also gave himself a 15 percent raise — up to $258,750 from $225,000 — but he’s not accepting the extra dough for his current term, and will only take a higher paycheck if he’s reelected.